Get to know the spookier side of the Empire State on a haunted history-themed road trip. Where most drive ghosts away, I drive towards them. Well, not usually; but I did recently on a road trip along the Haunted History Trail of New York State. Despite being a skeptic at heart, I’m always up for a good ghost story, and New York has more than enough to tell. Dating back to early native inhabitants and the American Revolution to when dignitaries began to build it up to the place we know today, tales of unrested spirits in the Empire State are drawn from nearly 400 years of history. 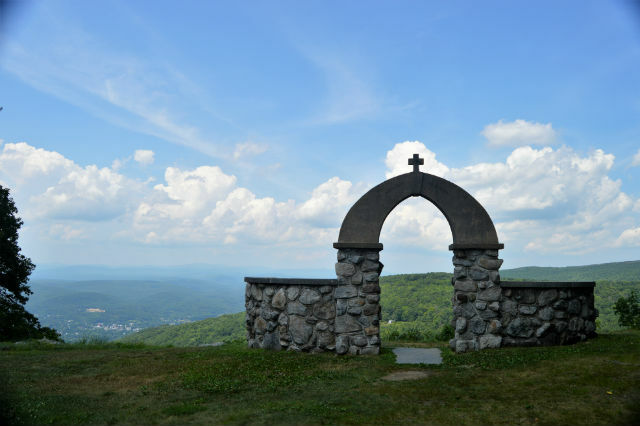 So, with piqued curiosity and an open mind, I headed on a haunted road trip from Long Island to the Hudson Valley, through the Catskills and up to the Capital-Saratoga region to meet the ghosts of New York past. 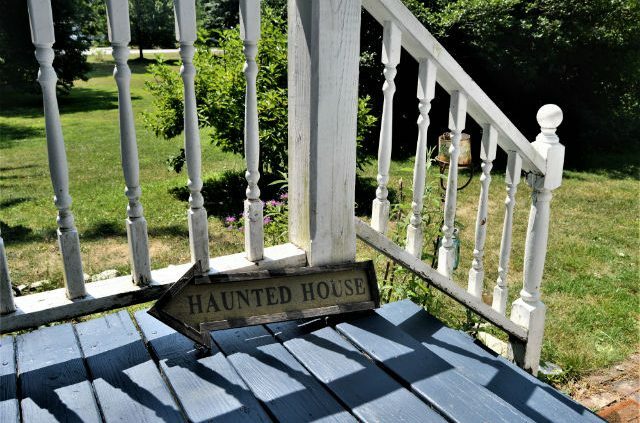 The Haunted History Trail of New York State was established in 2013 when Kelly Rapone of the Genesee County Chamber of Tourism noticed a growing demand – and a hefty supply – for more eccentric attractions. 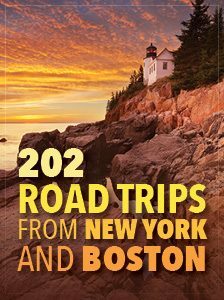 I narrowed my trip to the eastern regions, but the trail stretches state-wide, featuring 82 allegedly haunted hotels, restaurants, museums and other stops that appeal to paranormal fans, ghost hunters and those simply interested in learning more about the past. For the apprehensive, don’t let the creepy angle scare you away. The so-called haunted attractions are not outrightly frightening. In fact, the trail is a guide to some of the most beautiful and fascinating destinations in the state that you might not find otherwise. The goosebumps-inducing stories are there if you ask, and many locations offer private ghost tours. Though the trail is a year-round attraction, fall is peak ghost-hunting season. Grab a map and try to hit as many spots as you can! Here’s a look at the places that I visited. Maybe you’ve heard strange noises in your house when no one was home or felt a sudden chill in the room that makes the hairs on your arms stand on end. It could be the heat knocking through the pipes or the wind, or it could be something more elusive. At the real haunted houses of New York, certain occurrences have no explanation. 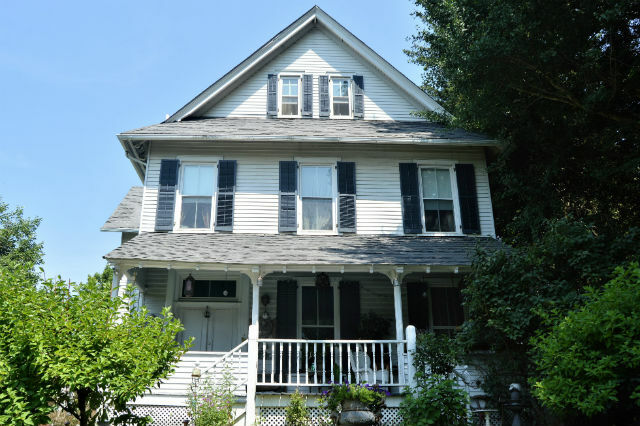 What some consider peculiar is the norm for homeowner Julia Drahos and her family at Miss Fanny’s Victorian Party House in Wappinger’s Falls. 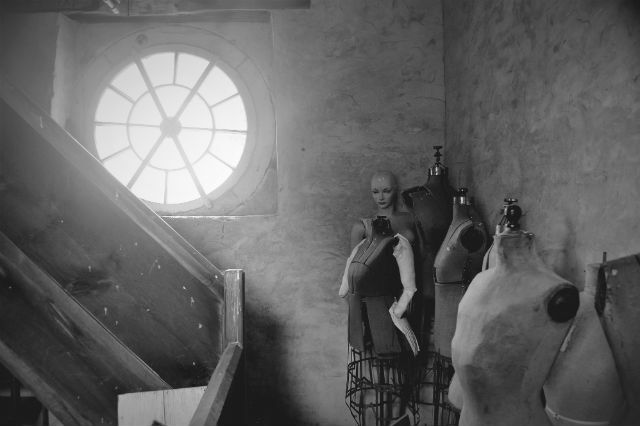 Part macabre and part kitsch, the 19th-century farmhouse feels straight out of “The Addams Family.” There’s an embalming table in the living room, a coffin in the attic and the occasional zombie mannequin in the hallway. But that’s not the weird part. 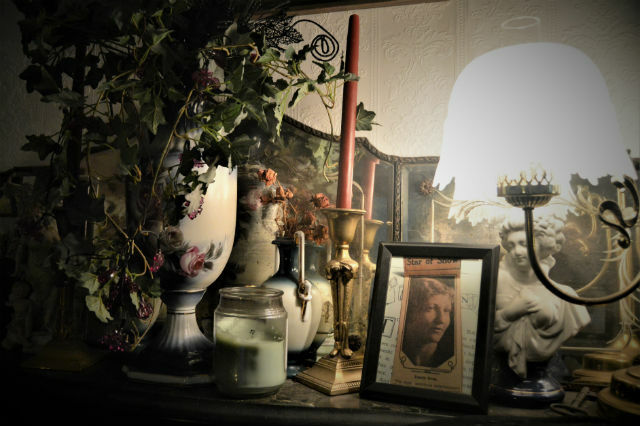 A photo of Fanny Van Wyck sits on the mantle at Miss Fanny’s Victorian Party House. Fanny’s spirit is said to be in the house. 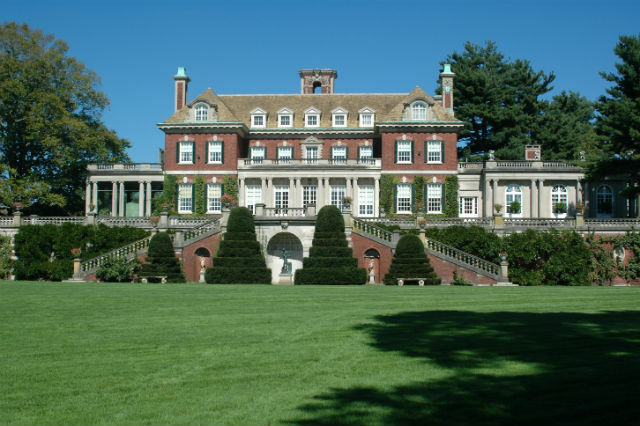 Miss Fanny’s has a few extra house guests who often make their presence known, one of which is believed to be the home’s namesake and former owner, Fanny Van Wyck, the last of one of old New York’s most prominent families. A clip of electronic voice phenomena recorded during a paranormal investigation of the house was identified as Fanny by the granddaughter of her former housekeeper. Another EVP session revealed a total of 17 spirits roaming the property. Julia, who is also a medium, is not afraid of her tenants. Mostly, she is pleasantly surprised by how parts of the past continually seem to reveal themselves through the supernatural. “It’s not only about the ghosts, it’s history,” she said, which she gladly preserves for Fanny and the rest of the gang by welcoming visitors into her home (by appointment only) for ghost hunts, showers, readings, ladies’ nights and other events. 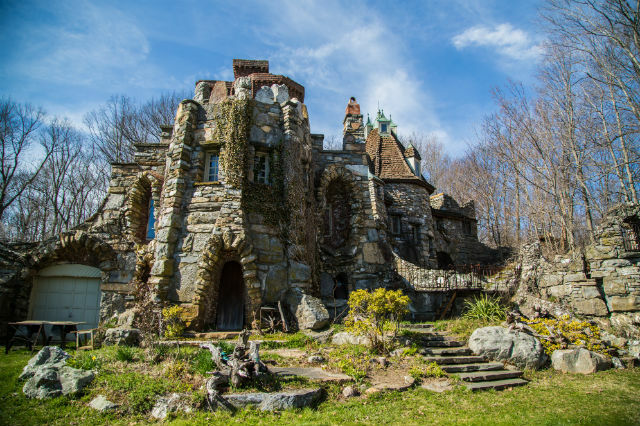 In nearby Millbrook, the owners of Wing’s Castle have reported a few strange occurrences in the past, earning it its place on the Haunted History Trail, but more than that it is an incredible live-in art piece. Artists Toni Ann Wing and her late husband, Peter, started construction on their fortress-like home in the 1970s, and work continues to this day. 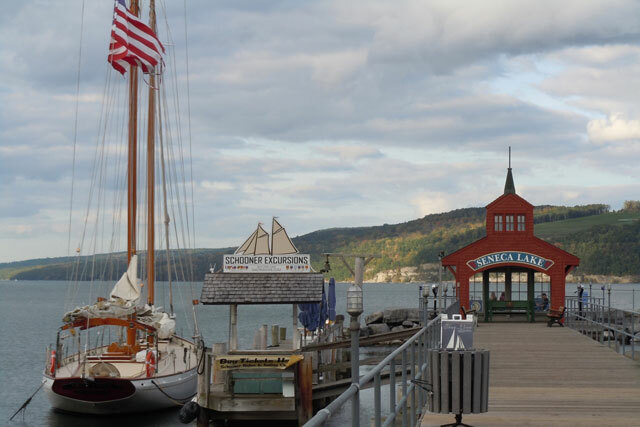 Filled with antiques, museum-worthy artwork and handmade details created from recycled materials acquired mostly from the Hudson Valley region, there are intricacies to discover around every corner. Wake up to sweeping views of the Hudson Valley when you stay in one of the rooms or suites part of the bed-and-breakfast. Tours run Memorial Day through Labor Day every hour from noon to 4 p.m. and weekends in the fall ($12; $8 children 11 and under). In Johnstown, the Knox Mansion is the most captivating house on the block. Built in 1889 as the home of gelatin magnate Charles Knox and his wife Rose, the historic residence tells many stories. Fortunately, owners Marty and Fawn Quinn are happy to share them. 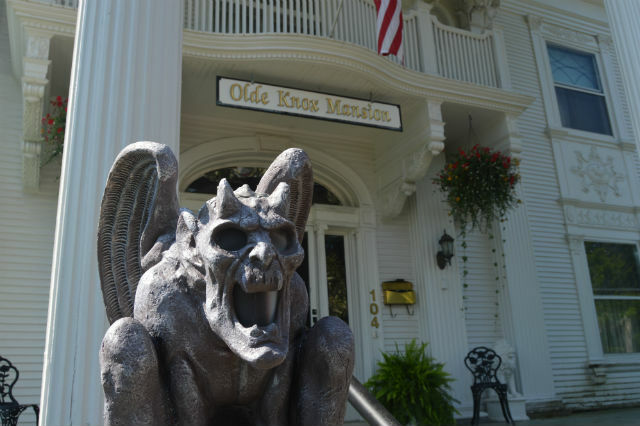 Some of the bizarre encounters at Knox Mansion are said to have turned skeptics into believers and scared expert ghost hunters away. The energy is there as soon as you walk in; for some a light presence; for others a force that stops them dead in their tracks. Paranormal investigators believe occupant ghosts include Rose Knox, a doctor who once lived in the house, and a little girl. There is also a phantom gardener that appears to children in the yard. Two of the mansion’s 42 rooms are available as a bed-and-breakfast, and tours are offered for $10 per person (appointments preferred). Halloween may be the best time to see the mansion, when it turns into a popular walk-through haunted attraction featuring themed spaces staffed by around 40 volunteers. No guarantees if the ghouls you meet are real or actors. Schoharie’s Old Stone Fort Museum is a bit creepy from the onset and instantly interesting. 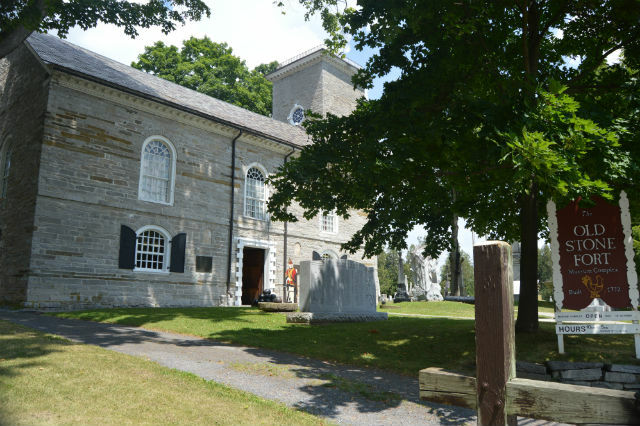 Set inside of a former German High Reform church built in 1772, it is surrounded by a cemetery and filled with historical artifacts, and – as quite a few ghost hunters have confirmed – a few lingering spirts. British troops attacked the building during the Revolutionary War during the Burning of the Valleys in 1780. It was one of three building in the area converted into a fort. One of the few Revolutionary war sites that have been preserved in its original form, it’s taken on a few different lives, but has been a museum since 1889. “It was our local internet (before Google),” said museum director Carle Kopecky. He took me up the old staircase of the church tower, a favorite stakeout for paranormal investigators, where the energy has felt so strong that some staff members can’t bring themselves past the first few steps. On our way up, we passed beams with names and dates scribbled on them that dated back to the 1800s, leading to a window (pictured above) where one psychic claimed to see a woman looking out toward the cemetery. I’m not typically sensitive to ghosts, but hearing that story in the exact place that it happened gave me instant chills. The most common repeated occurrence at the museum is the sound of footsteps on the second floor when no one is there. “More than one person has experienced that,” Kopecky said. For those serious about ghost hunting, the museum offers a program where paranormal investigators can request a few hours in the building overnight. The Saratoga Springs History Museum at the historic Canfield Casino. The Saratoga Race Course is known as “the graveyard of favorites” for its reputation of bringing down Triple Crown winners. If you are the betting type, that might be the scariest thought of all. For a thrill that’s less risky, the Saratoga Springs History Museum, located within the historic 1870s Canfield Casino in Congress Park, has a haunted reputation worth exploring. Tour guide and museum board member Charlie Kuenzel has seen and heard his share of ghost stories. Working in the building has made a believer out of him – and all other regular employees. “Everyone has bought in,” he said. A lot of money was won and lost at the gaming house in its day and some may still be holding out hope for a win. On occasion, Charlie has walked into the empty museum to find the roulette wheel in the second-floor gambling exhibit inexplicably spinning. Employees also frequently pick up smells of cigars and lilacs. 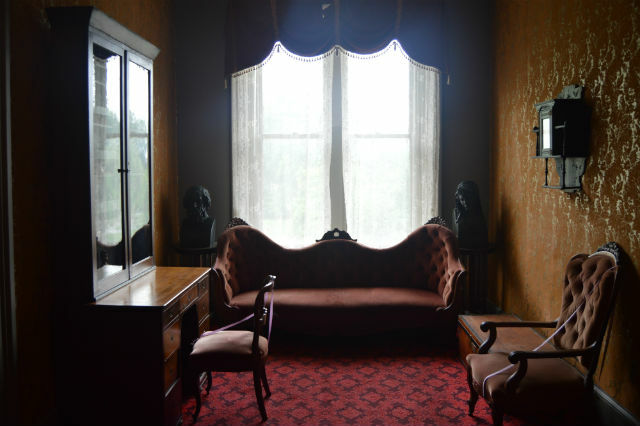 Many have claimed to see the apparition of a man sitting on this couch on the purportedly haunted third floor of the Saratoga Springs History Museum. “The energy, without question, could be from past gamblers,” Kuenzel said, but most of the strange occurrences are attributed to the Walworth family. The third-floor Walworth Museum, which features several replicated rooms from the home of one of Saratoga’s most influential families, is a hotbed of activity. Since its installation guests and staff have consistently described accounts of an apparition wearing a white dress and the figure of a man sitting on a couch at the end of the hall. As confirmed by ghost hunters, the Walworths’ energy is held in their belongings. So basically, the family still thinks they are home. Ghost tours at the museum are Monday, Wednesday and Friday at the height of racing season and on demand. At Halloween, tours ramp up and there are occasional special overnight events for those brave enough to investigate the third floor in the dark. The gate to Yaddo Gardens. 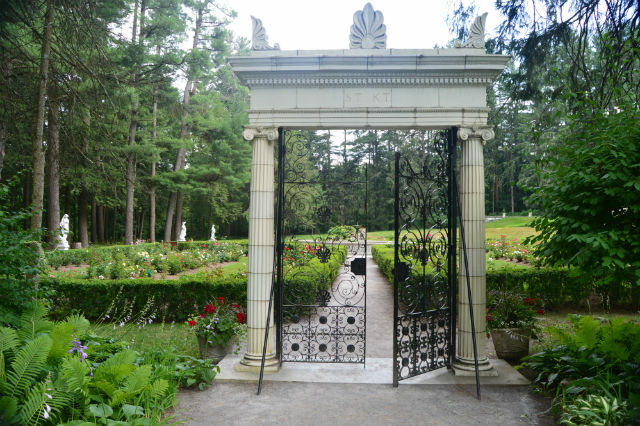 A short drive from the Canfield Casino, Yaddo Gardens offers a different kind of ghost tour that will leave you feeling more peaceful than spooked. The gardens are located on the grounds of the prestigious artists’ retreat Yaddo, whose notable past residents include Leonard Bernstein, Langston Hughes and Sylvia Plath. Yaddo was the vision of financier Spencer Trask and his wife Katrina. Though their life was gilded, the Trasks were surrounded by tragedy, some of which has been entwined with legends of the gardens’ mystic vibe. One story says that the four seasons statues that stand beside the rose garden have a special aura believed to represent the four Trask daughters who died as children. There is an unusual spirituality about Yaddo; it’s one of the reasons why the Trask family thought it would be a good place for artists. As docent Barabara Kolapakka described, “If ghosts were to be anywhere, they would be here.” The gardens were restored and are maintained by volunteer. You can visit year-round from dawn to dusk. Ghost tours are $10 per person and are available Friday and Sunday evenings at 5 p.m. through Oct. 28. Yaddo Mansion is exclusive to the artists who work hard to get there, but you too can claim your spot at a mansion, at least for a night or two. 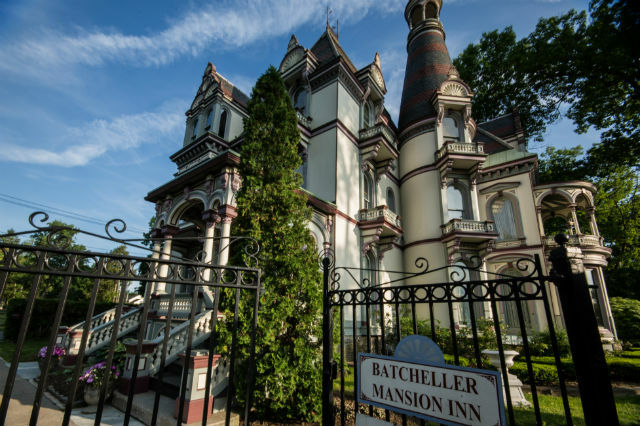 If you’re looking for a beautiful place to stay in Saratoga Springs that also has a bit of an eerie edge, the Bathcheller Mansion Inn is architecturally and historically stunning. Once the home of prominent political figure George Batcheller, the high Victorian Gothic mansion may still be occupied by its former owner, who likes to make his presence known. 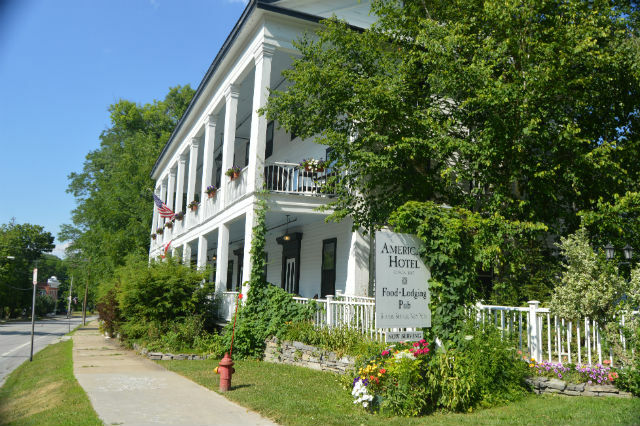 On my way back downstate, I stayed in the adorable little town of Sharon Springs at the American Hotel. It’s not listed in the Haunted History Trail brochure, but it was one of my favorite stops. An 1842 building restored after 30 years of vacancy with nine cozy rooms, antique furnishings, dining and porches on two floors, it was just the palate cleanser I needed after all the spooky places on my haunted road trip. 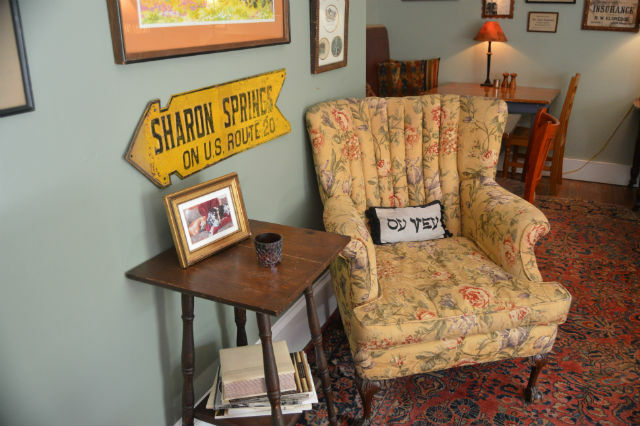 Sharon Springs is a great little getaway in itself with shops like Beekman 1802, cafes and a spa, all within walking distance along its main thoroughfare. While not exactly haunted, it turns out the American hotel has seen its fair share of Caspers over the years – a fact I’m glad I learned about after getting some sleep. Although listening to owner Doug Plummer tell me about them was a highlight of my trip. Plummer, who owns the hotel with his husband, Garth Roberts, is an amazing and animated story teller. With accents and all, he told me about the spirit of a “pissed-off rabbi” identified by a Southern clairvoyant staying over, and how she helped Doug get rid of him by way of an “Oy Vey” pillow peace offering that still sits on a couch in the lobby. Plummer shared a sentiment from the clairvoyant that helped me to make some sense of the paranormal experiences I heard about on my trip. It was that “energy can’t be destroyed, it can only be displaced.” So, if you are ever in a room and feel inexplicably weird, it’s because something is there – whether you can see it or not – and you innately know it. 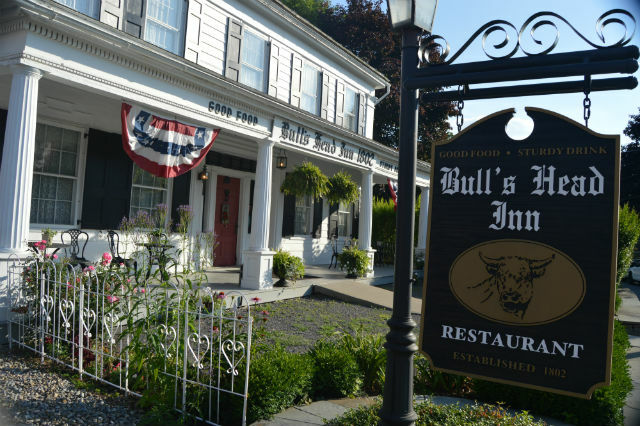 About 20 minutes away in the village of Cobleskill, the Bull’s Head Inn is the oldest building in town, and some might say, a local haunt. Constructed in 1802, its long-storied past includes being the residence of Mr. John Stacy and his wife Grace, an avid prohibitionist. All fingers pointed to her when odd activity such as slamming doors, items being pushed off tables and sightings of a woman in white began to occur around 1966 soon after a bar was installed. “When people see apparitions, they said it’s Mrs. Grace Stacy,” said owner Chris Guldner. Most of the supernatural action happens on the second floor of the restaurant, where Guldner says ghost hunters have come in and picked up a lot of activity on their equipment. He has also experienced some odd occurrences such as seeing a kitchen sink being turned on by itself. If you are tuned into abnormal energy, you might feel it here. Either way, come for the history. Although the entire restaurant has been gutted and refurbished (check out the new Cellar Tavern), it stays true to its roots. 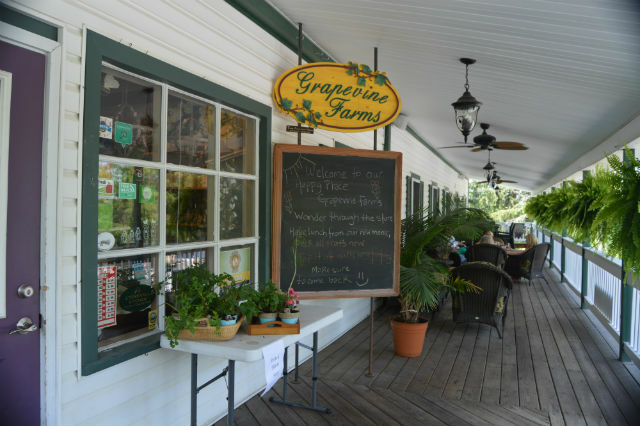 At Grapevine Farms Restaurant & Boutique, also in Cobleskill, customers often tell the owners that something feels off, especially on the third floor of the restored 1860s farmhouse. Not to fear; it’s only former owner – and resident spirit – David. The place is completely charming and homey, so it’s understandable that he wouldn’t want to leave. For husband-and-wife team Tim and Tracy Purcell, their business is a literal extension of their home, and they treat it as such. Family photos fill the walls of the restaurant, along with personal heirlooms and mementoes, creating an atmosphere that immediately makes you feel as though you are welcomed as a friend. 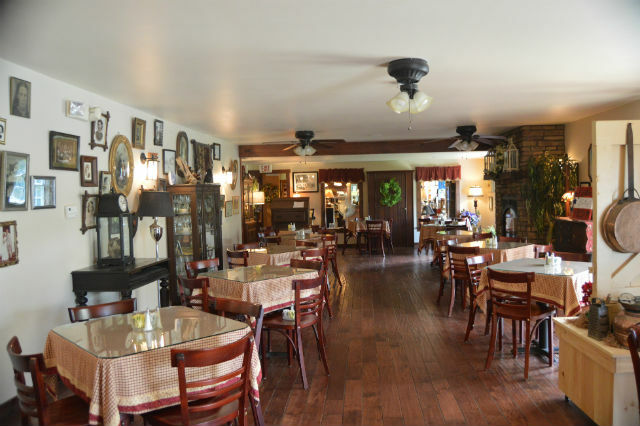 The dining room at Grapevine Farms Restaurant & Boutique. While overhauling the space they learned that David Hiltz and his wife were buried in a cemetery in the backyard. And though Tim tends not to believe in the ghost stories, he does keep the gravestones that he found on the property right where he found them as not to disturb any forces. If you would like to learn more about their spectral side, look out for special events during the Halloween season, when they will occasionally host dinners and talks featuring mediums and other paranormal experts. Stop in for lunch daily from 11 a.m.-3 p.m. (try the chicken salad sandwich made with New York state riesling-soaked cranberries). The shops are open until 6 p.m., giving you extra time to explore the themed rooms, which range from jewelry to candles to Christmas. Hang out on the back or front porch with a glass of wine or coffee from the coffee bar and you could easily make a day out of it. In the town of Crawford, the tiny hamlet of Pine Bush is known as the UFO capital of New York. It is best recognized for its annual UFO fair, a single day in the beginning of May that draws seven to eight thousand visitors. The fair is fun for all – lighthearted enough for those who want to dress like aliens and get a little spacey, yet serious enough for believers to not feel judged. Experiences are quite common in these parts. During my visit I got to meet paranormal and UFO expert Linda Zimmermann. An author of 21 books on the subject to date, Zimmermann has interviewed several hundred people about their sightings and experiences and is an experiencer herself. To learn more about the history of sightings in the area, be sure to check out the Pine Bush UFO and Paranomal Museum. 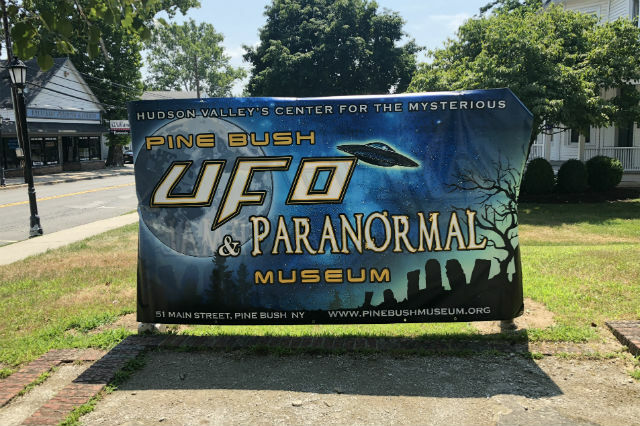 After much demand for a year-round UFO destination, the museum made its debut at the 2018 Pine Bush UFO fair in its new permanent home at 51 Main St.
Museum director Lance Hallowell has carefully curated a collection of artifacts and research that tell the stories of happenings in and around New York and New England. In addition to learning about reported abductions (and a great photo-op for visitors to stage their own), there is also a haunted exhibit which includes an EVP room that features the summoned voices of ghosts, including those recorded right in the museum building! Dive even deeper at a lecture or Q&A session at the museum’s Paranormal Center. I concluded my trip at a mountain overlook beside the Cragmoor Stone Church. The mountain range is believed to be a strong lure for UFOs, but simply watching the clouds cast their shadows over the Shawangunk Ridge was enough of a thrill for me. After days of thinking about the afterlife and the extraterrestrial, it brought me right back down to Earth. Are you interested in haunted history? Would you like to explore this side of New York? Tell us in the comments. 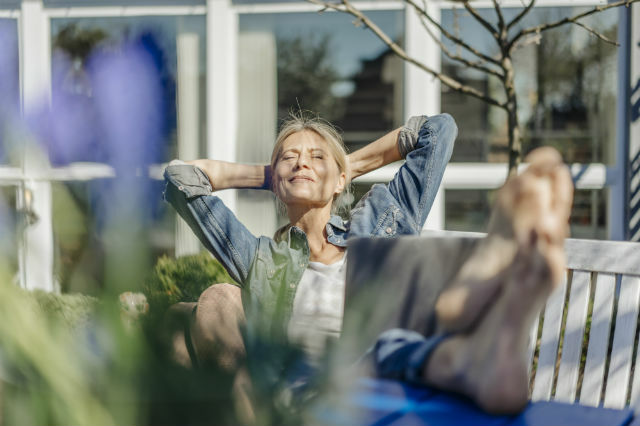 Article tags: a road trip, casino, garden, home, home s, homeowner, hotels, house, hudson valley, lunch, Mystic, restaurants, road trip, road trip from, the home, the hotel, the restaurant, tours, trip, trip from. 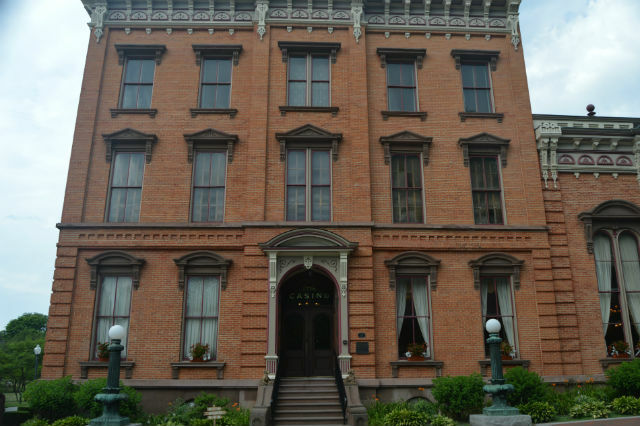 Next time you are in the Leatherstocking Region, be sure to stop by The Farmers’ Museum in Cooperstown for a ghost tour Friday and Saturday evenings in October.